January | 2016 | Portland! I was asked by the Singapore American School’s robotics program to develop a robotics kit for their intro course that was able to drive two small DC motors wirelessly at low cost. 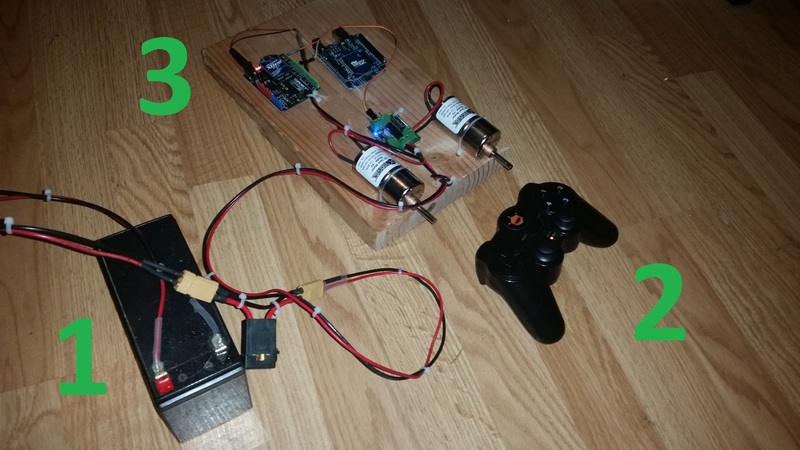 I picked the DFRobotics arduino-based gamepad as the controller and an arduino for the robot. The two arduinos (gamepad and robot) communicate using xbees, which are small wireless modules that are easy to interface with using serial port communication. arduino power cord. These are available as pre-wired pigtails. I soldered this to an extension and connected it to the 12V battery. The connection is made at the motor controller’s input block by putting both pairs of wires in (near the number 3). The arduino’s power supply is a linear regulator and the arduino runs on 5V, so powering it with 12V makes the regulator drop a lot of voltage internally, heating it up. This works, but it’s at the limit of the arduino’s specs. Just something to be aware of. a. b. 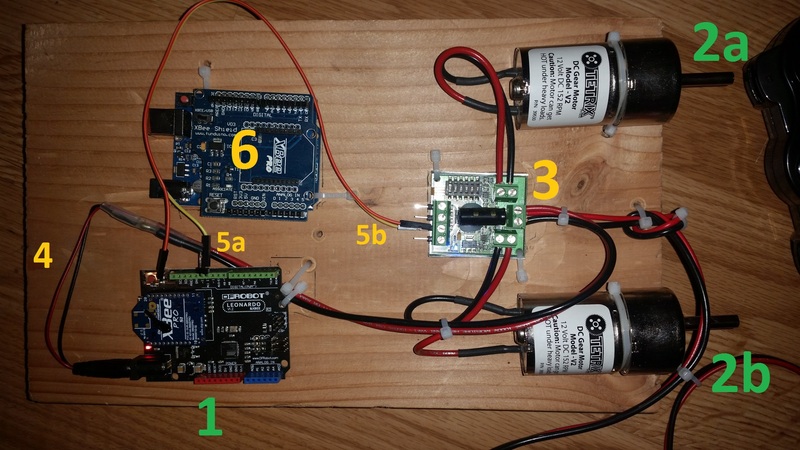 Signal wire from the arduino to the motor controller. This is a software serial port on the arduino on pin D11, connected to S1 on the sabertooth 2×5. The yellow wire is used, the orange wire doesn’t go anywhere. extra arduino UNO and xbee shield. I left this on the board to show another option. I started prototyping with this and realized that it can’t support USB debugging and the xbee communications at the same time (both use the same serial port, it only has one). I switched to using the arduino leonardo to gain an extra serial port for debugging. I do not recommend using an arduino UNO, for this reason. See the github readme for more in-depth documentation. Overall, the kit works really well, with great control response time, good range with the 60mW xbees (I’m not sure how far – it covers my whole house), and OK gamepad battery life of a few hours (the gamepad needs 4 volts or higher to work well though, so I don’t recommend rechargeables). It’s fully programmable and my hope is that students will be able to extend its functionality easily, using my example code as a starting point. This entry was posted in Uncategorized on 20 January 2016 by larsonm.